India's largest river island is covered with Hindu sacred place and supports a thriving agricultural sector, though constant erosion is taking its toll. Brahmaputra wetlands on Majuli Island. India's largest river island is covered with Hindu sacred places called Satras. There were about 65 Satras at one time, but today only 22 remain in existence. Majuli Island also supports a thriving agricultural sector, though erosion by river waters has reduced the original island size of 483 square miles to just 163 square miles today. It is ironic because, as the river expanded over time, the island is getting smaller. The island is in the middle of the river where fishermen fish, while farmers and their families are either planting rice, cultivating it, or harvesting it. The island has an idyllic atmosphere that seems to permeate rural beauty. A long and narrow island existed in earlier times in the vicinity of the two rivers, and th two parallel rivers flowed on its opposite sides. Centuries ago, the Burhidihing River flowed to its south, while the Brahmaputra River flowed to its north. However, two earth-shattering events occurred to reshape the landscape around what is now Majuli Island. From 1661 through 1696, numerous earthquakes rattled the island and, in 1750, a deluge largely covered much of the island, lasting for 15 days. Later, after the floodwaters subsided, a new island appeared as a result of the Brahmaputra River splitting into two rivers. Thus new island became the Majuli (meaning "land in the middle of two parallel rivers"). Today, Majuli Island is inhabited by the peoples of three tribes, namely the Deori, Assamese, and the Mising. The island has a population of about 150,000 who populate its 144 villages. Rice is its most important crop, and around 100 different varieties of this cereal grain are goriwn on the river island. Some are grown completely underwater, while others are upland or other non-aquatic rices. Other manual activities include hand-loom weaving done by women using silk and cotton. Occupations include dairying, fishing, boat-making, and pottery. Tourism has also become a part of Majuli as its colorful culture and arts are showcased to the world. Annual festivals and the idyllic vistas attract more visitors each year. Birdwatching is another activity that has attracted tourists to visit the island. Island visitors are almost always awed by the pollution-free air of Majuli, in stark contrast to the smog-ridden air of many of India's metropolises. 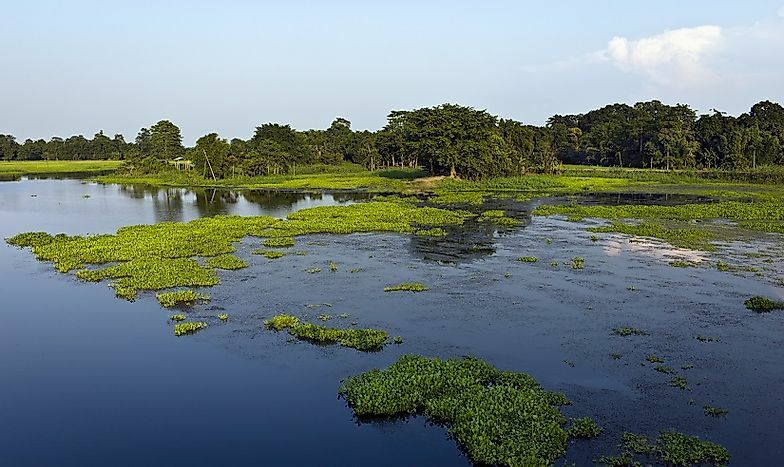 Sand dunes, wetlands, and verdant surroundings dominate the island's topography with its diverse flora and fauna, some of which are endemic and indigenous to Majuli. There are a lot of avian visitors during winter as the island is in the path of migratory birds. The Siberian crane, Greater Adjutant storks, Whistling teals, and pelicans all come for the winter to stay or rest. Although the birds mostly feed before flying off to their final destination. Wild ducks and geese also inhabit the island by day to feed. There are also 18 islets around the island called chapuris, which serve as the breeding grounds for many kinds of birds. The island of Majuli is one of those islands that seems to be just perfect but for its inability to stop water from eroding its banks and shoreline. The island was born out of water after the Brahmaputra River split into two after a great flood that lasted for 15 days. It seems that the river is trying ti reclaim it. The problem has become a real threat since 1991, about 35 villages have disappeared due to land loss to the river. The Indian government has stepped in on the problem with a grant of $55 million USD to find a way to stop the erosion of Majuli Island. Several suggestions were brought up, including the construction of two flood gates on the Kherkatia Suti River, which is a tributary to the Brahmaputra River wherein the island is situated.